Hello Friday... and hello friends. I have heard a lot of "sayings" about loving the little things... it's in the little things... or that the big things are the little ones... etc... I always say that it is in the little things that a person shows a real self. For me this applies to good and not so good things. So no matter how little you think are the things you do for someone, probably they are big for them. I had these stamps from Unity that had not used before and discovered this sentiment with this "ribbon" shape... Love it! Then... inspired by some colors and images in the Unity Be Inspired challenge, I colored this image showing several glass vases. I love coloring even though I don't think I color that well. I mostly use watercolor pencils, because are an economic tool vs other coloring markers... and I wanted to achieve the softer look these pencils help achieve. So watercolor pencil it is! But besides all that.. do you see this background I just made? I really like it. It is one of those things that suddenly come to your mind. I was the other day thinking about nothing (literally) and though of vellum and how many cool things you can do with it... and I imagined circle shapes in a layout... So soon after that thought, I was at my scrapbooking table playing with vellum. I cut the circles and assembled as background with mini glue dots. Sprayed some color on it and then postioned the image and sentiment as shown. I covered the "glue dot" that were seen through the vellum, with pearls. I also added some glossy accents to the vases in the image for a more glass-like look. Hope you love the final result as much as I do. 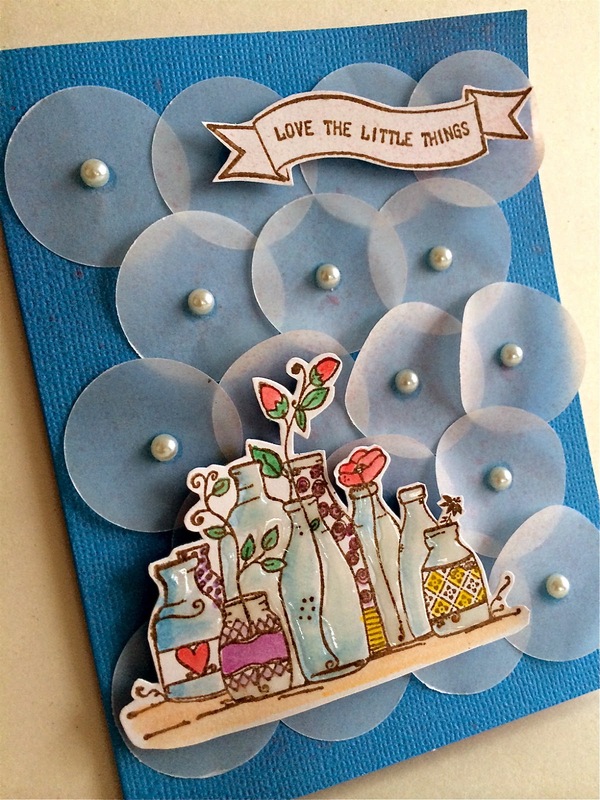 I'm linking this to Unity Stamp Co Friday Friends with Flair, and the Be Inspired Challenge. Thanks for stopping by. I will enjoy reading your comments. That is one superb background. How creative! 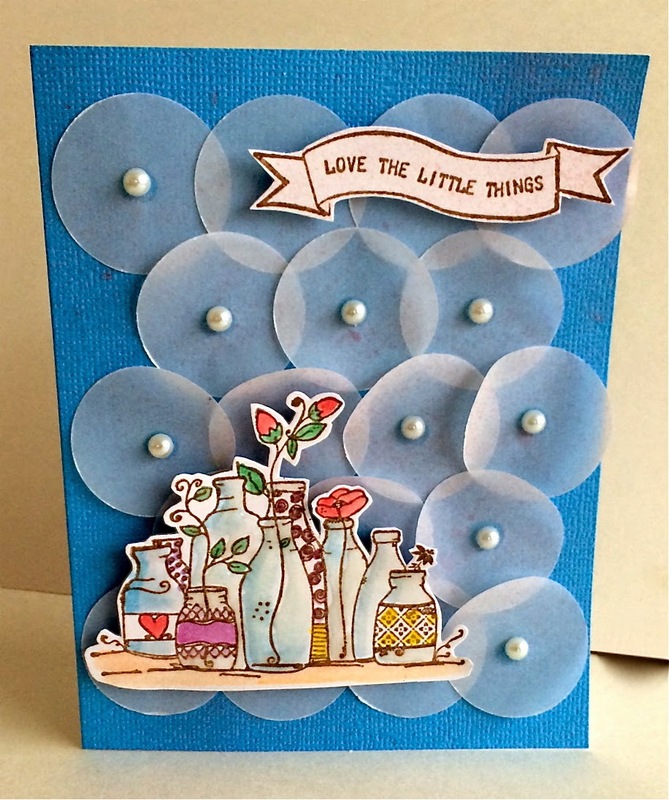 Love the vellum circles as a background. Very pretty card. Really fun design, Myra. 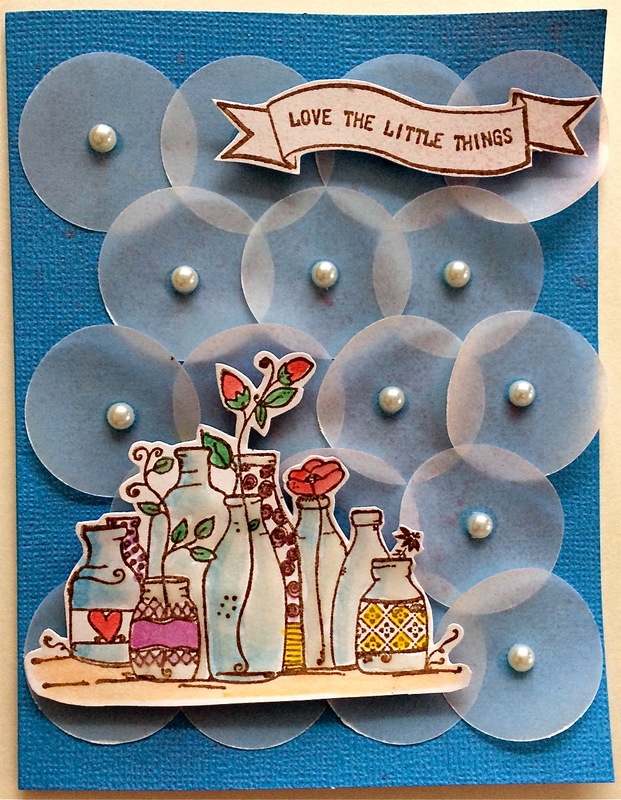 The vellum circles are really fun! OMG... freaking amazing.. totally loving the background.. brilliant colouring.. woo hoo.. i love this!! Very pretty--I like the unique background. Oh, wows - what a super cool background! Love the card! the circles are pretty cool! Lovely water-coloring also. You go girl...with all your cool inventiveness! I love your card, so very beautiful and creative! Creative use of vellum. I love the bottles and your coloring is perfect. Myra, this is really really COOL!! I absolutely LOVE this! Wonderful card and fabulous card design! I think you color quite well with your pencils, and what a unique and clever background too! NJ!